This book (as you can see above) was REALLY long!! It is a big hunk of a book! 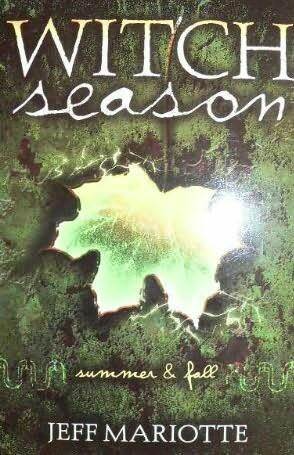 It is a omnibus and has the first two books (Summer and Fall) of the Witch Season series inside. These two books were also pretty good! I was expecting a story kind of like the L.J.Smith omnibuses but it wasn’t like that at all! Jeff Mariotte’s writing is pretty distinct and has a lot of descriptors. I can totally imagine the scenery in these books, but he doesn’t describe the characters really well. I don’t connect to a majority of them because he didn’t give too much of a background on them. Summer starts out with a group of 6 kids living in a house together in La Jolla, CA and then a mysterious stranger lands on their doorstep half dead and the central character of the story, Kerry, decides to take him in and nurse him back to health. Eventually he leaves once he’s better but he does come back and the group finds out that he is a witch and is battling an evil with, Season, and she happens to be in La Jolla as well. The first book is basically a hunt looking for Season and then the second book Fall describes the aftermath of Season and Daniel’s epic battle which occurs at the end of Summer. I really liked the books, but sometimes they was just too many words and they could have been cut back on a tad. I also didn’t like some of the characters attitudes after the battle. (I don’t want to say too much on that, because I don’t want to give anything away) Also, there was a lot of grammar, spelling, and pretty much just common errors in the book (Bad editing on the editors part!!). Would I recommend this to a friend? Probably not but it was a good book to pick up and flow through fairly quickly. There is another omnibus that follows this one and I will be reading/reviewing that one too.